Porsche has decided to bring a little more racing tech to the street, this time in the form of centerlock wheels. You know, those are the kind of wheels you see on race cars, the type that are held on by one big nut right in the middle of the wheel, rather than four or five little ones. They’re on the car for performance reasons. First off, they weigh less, which helps in over-all performance, and specifically it reduces unsprung weight, which greatly increases handling performance. Also, and not that this wold come into play for every day driving, they also shave time off of pitstops at the track. It takes less time to deal with one big nut that it takes to deal with four or five. Next time you watch a stock car race, notice how long it takes them to get a fresh set of rubber on the car versus how long it takes for a Grand Prix car. That’s why GP cars use centerlock wheels: It saves time during a pit stop. 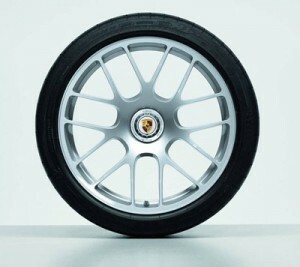 Anyway, the engineering angels from Stuttgart are now offering 19-inch RS Spyder wheels exclusively for the 911 Turbo. As you would expect with anything Porsche builds, they’re going to work, and, they’re not going to be cheap: The retail price of the 19-inch RS Spyder wheel in Germany including 19 per cent VAT is Euro 3,510.50. Yeah, they said “wheel” as in singular, so getting a set of four will be the equivalent of buying a new Miata.